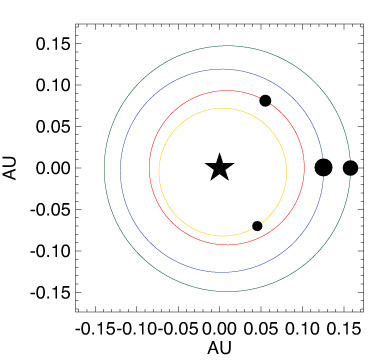 May 11, 2016 – A four-planet system observed several years ago by the Kepler spacecraft is actually a rarity: Its planets, all miniature Neptunes nestled close to the star, are orbiting in a unique resonance that has been locked in for billions of years. For every three orbits of the outermost planet, the second orbits four times, the third six times and the innermost eight times. Astronomers from the University of Chicago and University of California, Berkeley, who reported the discovery online May 11 in Nature, are particularly interested in this stellar system because our system’s four giant planets – Jupiter, Saturn, Neptune and Uranus – are thought to have once been in resonant orbits that were disrupted sometime during their 4.5-billion-year history.